Hololens Can Turn Into a VR Headset? So the Hololens can fill the whole field of view with image? That means it then turns into a VR headset? Is this correct? And does the image you see 3D like we see in VR headset? Or just flat? 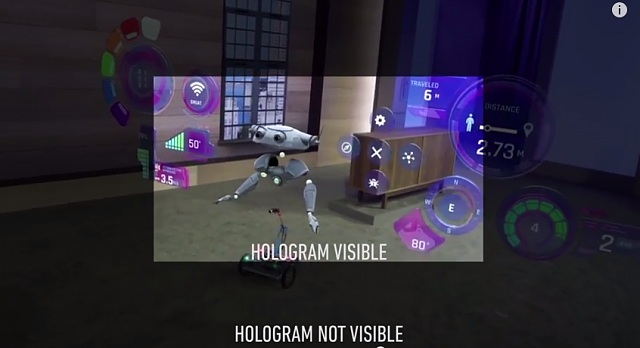 No, HoloLens cannot fill your Field of View with a hologram. It can only fill a small square in front of you with holograms. I saw this video where it shows 360 view of an Italian city. Its starts with a painting then grows to cover the whole fov. It is 360. That means it's VR right? Some of the videos are a little misleading. When capturing video from a HoloLens, it actually renders more to the capture than the physical device is capable of showing. Even though Windows is rendering the full view to any screenshots or video, the hardware can only put the highlighted area in front of you. By alphacker4 in forum Which VR are you?